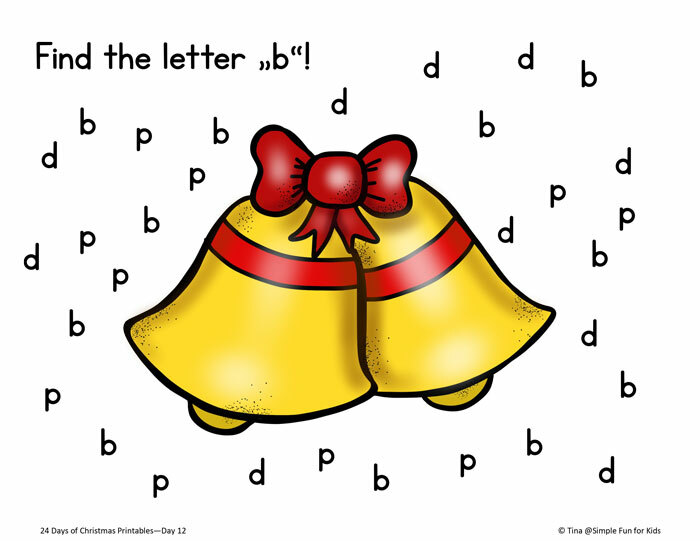 It’s day 12 of the 24 Days of Christmas printables – and we’re already half way through! 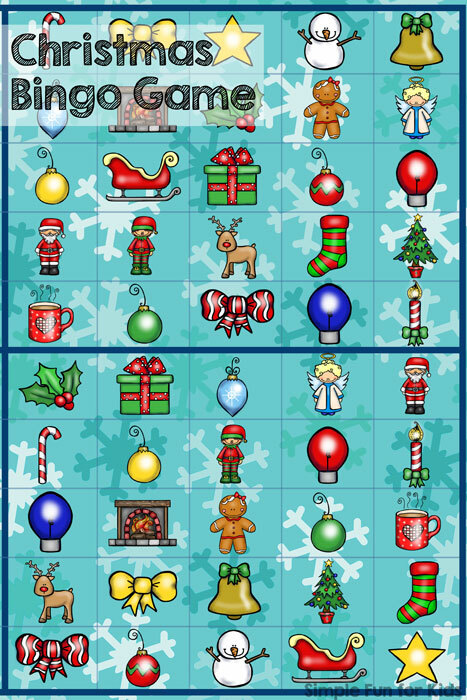 Yesterday, I shared Christmas cupcake toppers, and today, I have a Christmas Bingo Game for you! 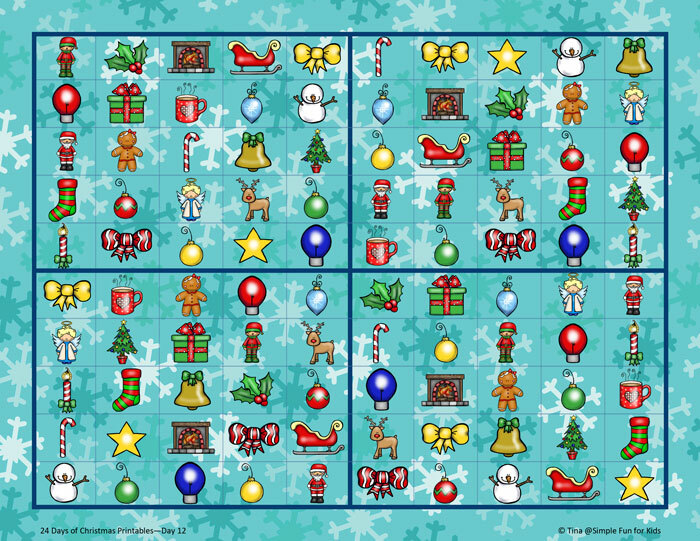 You get four different 5×5 Christmas bingo cards on one page and a call sheet that has all the images used. Print the sheet with the bingo cards and the call sheet and cut the cards apart. You can cut apart the call sheet if you want to draw images randomly or you can choose to leave it intact and mark off whatever you’ve called. Make up your own rules for the bingo game, depending on the ages and attention spans of your kids! Maybe even just marking two images side by side can be enough to win for younger kids. 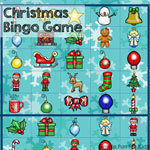 Download your Christmas Bingo Game! 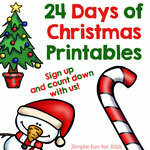 Did you know that there’s a paid version of this 24 Days of Christmas Printables advent calendar? Today’s pdf file for paid subscribers included the Christmas bingo card and image call sheet above plus an extra call sheet with the items names plus two Christmas letter find pages. all in one convenient daily pdf file for just USD 7.99 for all 24 days! For even more convenience, you’ll receive a direct link to your complete set of Christmas printables the day before the post with the free printable goes out. That means you get a head start to get ready for the next day’s Christmas countdown, plus you don’t have to click around my site or read a post, just go straight to the file and print it. And even if you’re not using it as an advent calendar, that’s definitely a lot of different printable Christmas content for your money! On day 12, we’re already at 46 extra pages that aren’t available anywhere else. Get today’s full file for USD 1.00 or get the full content for all 24 days for USD 7.99!